I really love a good molten chocolate cake (or molten chocolate lava cake or fondant au chocolat for fancy people ). I know, to some people, it’s an overdone, passé, and almost retro dessert, but I LOVE it. It is, quite simply, warm chocolaty goodness defined, and, when done right, it is simply wonderful. So, it’s no surprise that I can’t get enough of this awesome molten chocolate cake created for the Salon du Chocolate by designer Stéphane Bureaux and his design group. It is practical and artistic and fun, all at once! 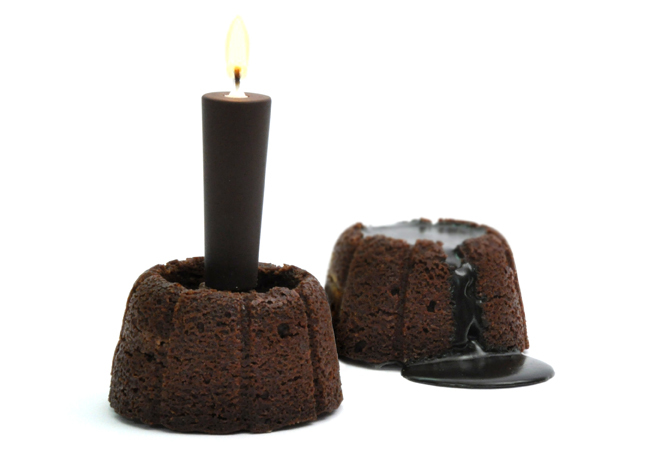 Simply place a chocolate candle inside the cake, then watch as it slowly burns, filling the interior of the cake with warm liquid chocolate. Voilà! Molten Chocolate Cake! To see more yummy creations by Stéphane’s Bureaux, check out his website, right here. For more on the molten chocolate cake, click here. where do you find these edible candles? i've looked everywhere for them and can't find a single thing. the closest thing i could find was using an almond to light the candle (which you could just make out of soft chocolate) but i don't see how it would burn all the way down... is this just supposed to be an abstract theory or something that can actually be practiced? Yikes! I don't know where that spelling came from, but it's been fixed. Thanks for letting me know! Philippa: I'm actually not sure if you can buy them or if it's more of an art project. If you contact fxballery (see last link), they may be able to tell you more. Good luck! You've got another new follower.